We live in a time when new scientific breakthroughs in immunology constantly reminds us of the important benefits of a balanced and healthy immune system. At the same time we are increasingly exposed to pollutants and environmental toxins, we stress more, we don’t get enough rest, we eat too many processed foods and the majority of people are vitamin D deficient. We have also lost the interaction with a wide range of microorganisms found in the natural environment, which according to the “Old Friends” hypothesis has left us more prone to immune disorders like allergies and asthma. As a result many families are struggling with reduced immunity or overactive immune systems. Under these conditions people are looking for solutions that will give immune support and improve their health though a well balanced immune system function. ImmiFlex was developed to address this growing demand and has fast become a preferred choice amongst consumers and healthcare professionals for immune health support around the world. ImmiFlex® and ImmiFlex Kids, from the Norwegian founded Immitec Group, are immune supplements containing Wellmune® beta 1,3/1,6 glucan together with Vitamin D3 for additional immune health support. The ImmiFlex range of dietary supplements for the immune system promote a healthy lifestyle for the whole family, and may even sustain a healthy immune system during periods of intense mental and physical stress (studies: cyclists, firefighters, marathon runners, medical students and stressed women). With $350 M in research and development, and 9 human clinical trials, Wellmune in ImmiFlex is clinically proven to boost key immune cells that help you and your family stay healthy. Wellmune studies further confirm that these highly purified yeast beta glucans (Wellmune is non-allergenic and does not provoke Candida albicans) boost the immune system to maintain health and wellness after intense exercise, enabling sportspeople to train harder and longer. For the safety of professional athletes and consumers alike ImmiFlex is accredited by Informed-Sport, one the world’s leading quality assurance programs for sports nutrition supplements. There are many theories seeking to explain why our immune health has become fragile in spite of modern hygiene and the easy access to food so many of us take for granted. In addition to the “Old Friends” hypothesis the “Hygiene Hypothesis” looks at the consequences of the immune system not being exposed to as many health challenges as it used to. It is thought that left unchallenged the immune system may get “bored” or “confused” and start attacking own cells and tissues, or become hypersensitive. Scientists like Dr Paul Clayton believes that beta 1,3/1,6 glucans, well-known immune modulators and a type of fibre, may play an important role in regulating our immune defences. Unfortunately these types of beta glucans have gradually disappeared from our food supply over the last 150 years or so, luckily they can be supplemented. By taking ImmiFlex every day you secure important nutrients for your immune system like Vitamin D3 and Wellmune Beta Glucan. And well-known as the sunshine vitamin is for regulating the immune system, it is Wellmune that keeps it alert and binds with billions of immune cells, safely mobilizing your first line of defence to keep you healthy. Interestingly research published in Immunity in 2011 traces parts of our adaptive immune system back to a common ancestor of mammals, amphibians and cartilaginous fish over 400 million years ago. This is relevant as science confirms that beta glucans are non-toxic natural immune modulators that can improve the immune system across species. Clinical Wellmune research also shows us that the beta glucans our immune systems evolved to recognize are still important components for optimal immune health in humans. Consumers looking to buy supplements for the immune system often have to deal with questionable marketing and unsupported health claims. Making an informed choice is becoming increasingly difficult. ImmiFlex on the other hand puts safety, science and effectiveness firmly back into the hands of the consumer with a clinically proven ingredient and a mission to enhance quality of life. Wellmune is unmatched in documentation on safety and immune support. It is also the only beta glucan in the market with this level of comprehensive clinical research, documenting mode of action on the innate immune system and subsequent health benefits. Together with Vitamin D3 ImmiFlex® contains 250mg of Wellmune®, the serving used in most preclinical studies and the so far 9 human clinical trials. To help you and your family nourish the first line of defence the way nature intended all our beta glucan supplements combine Wellmune and Vitamin D. These are important nutrients for the wellness of the whole family and are recommended on a daily basis because of the short lifespan of innate immune cells. Contrary to immune boosters continued use is recommended to help sustain a responsive and balanced immune system. For many families ImmiFlex becomes part of a powerful preventive healthcare strategy that helps preserve the wellbeing of each family member. We at Immitec are therefore proud to say: ImmiFlex Shields You For Life. 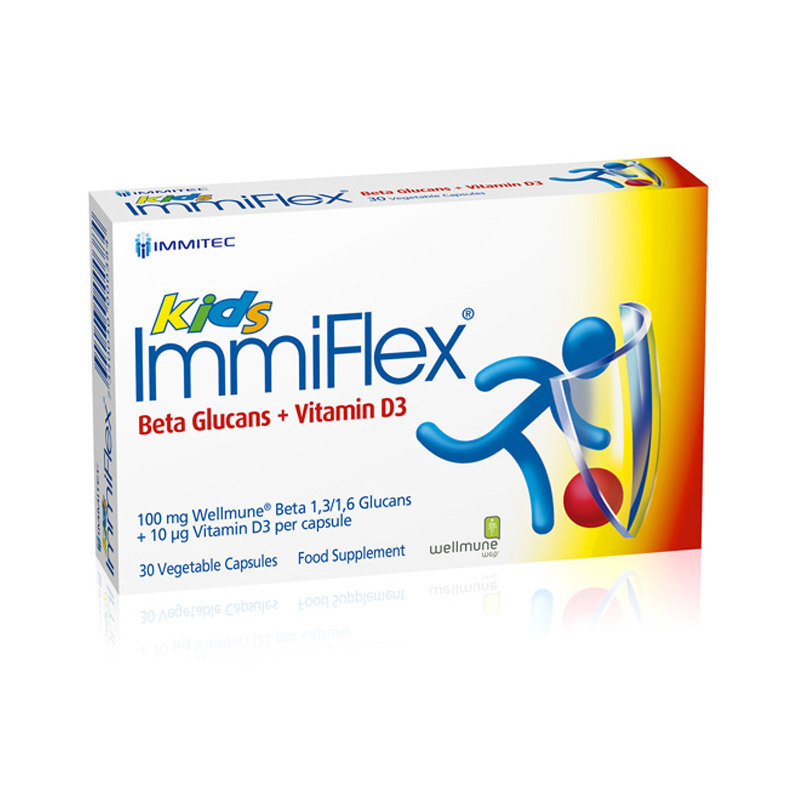 Visit ImmiFlex and ImmiFlex Kids to learn more about supplements for family health. How does ImmiFlex with Wellmune promote Immune Health? 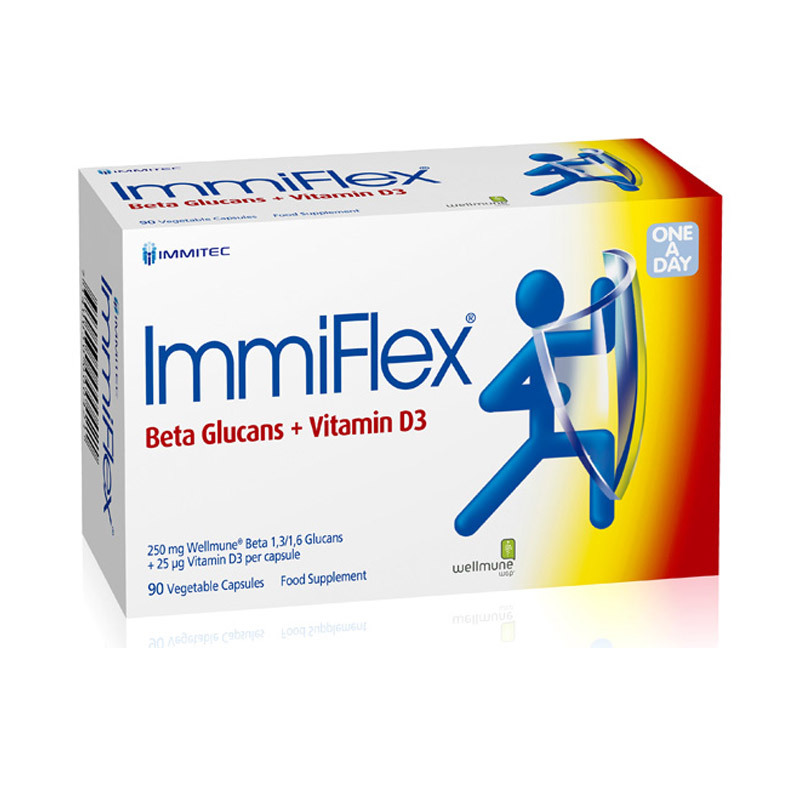 ImmiFlex is a Norwegian immune supplement from Immitec with active ingredients Wellmune yeast beta 1,3/1,6 glucan and vitamin D3 for a healthy immune function. Our immune system supplement is the result of 2 years of research into natural immune boosters and other natural immune activating ingredients available on the world health market. Only after reviewing the clinical research and documentation available on Wellmune from Biothera we knew we had found the right ingredient. And in 2006 the first ImmiFlex supplement was launched as a one a day capsule in Norway. It soon turned out our focus on finding the best clinically documented immune ingredient, which could also provide the best documentation on consumer safety, was the right choice. A mix of customer testimonials in the media, feedback from natural healthcare practitioner and perhaps also design, quickly led to ImmiFlex becoming the most recommended supplement for the innate immune system by professional healthcare providers in Europe. Besides all the recommendations and associated health benefits, nature actually offers millions of good reasons to take our immune system supplements, just read “Why Take ImmiFlex?” Above. The ImmiLine range of ImmiFlex supplements for the immune system is available in about 20 countries around Europe, the Middle East and Africa. Both ImmiWorld and ImmiShop (see menu) gives you an overview of the countries you can buy ImmiFlex in. Under “Partners” in the menu you find more information about some of our distribution partners and local language pages.